Beyonce is on top of the world right now! Almost a week ago Bey surprised the world when she dropped a visual-album along with 17 videos overnight. The album has sold more than a million copies and will spend it’s first week atop the Billboard Top 200. In celebration of her new self-titled album, the pop-star hosted a screening of her 17 new music videos at the New York’s School of Visual Arts. After watching the 17 videos along side fans, Beyonce answered a few questions submitted by more fans on Instagram via hashtag, #AskBey. 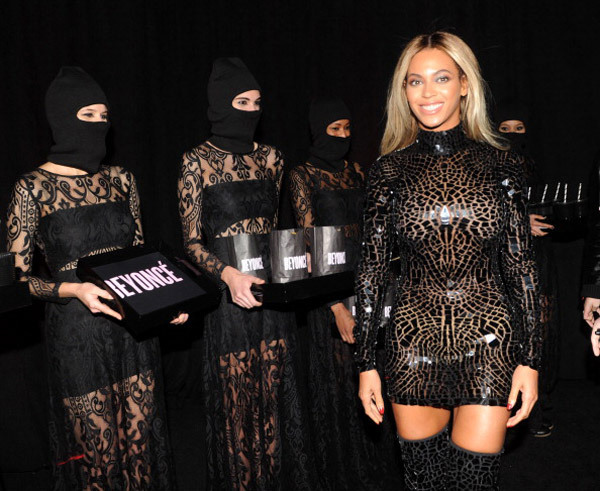 Beyonce executes the questions informing fans of inspirations and experiences in relation to the production and response to the album, ” I’m proud of myself as a woman … the biggest message is owning your imperfections and all the things that make you interesting, because I refuse to allow someone to put me in anyone’s box”, she explained when asked about the album’s message. This is Beyonce’s first album under her own management; she recently part ways with her father’s management team that produced 4, “My father taught me so, so much. When I decided to manage myself, it was important to me not to sign to some big company. I wanted to follow in Madonna’s footsteps and be a powerhouse. When you get to this level, you don’t have to share your money or your success… And we did it. And it’s my company”. Beyonce also explained how being a mom inspired her album, “It’s interesting how motherhood changes you and it changes your perspective on life. I took all the things that I wanted to change about myself and all the things I wanted to share, and I put it into this record”. Another point I found interesting when Beyonce was asked about any insecurities on keeping the album a secret, “I just got off the stage, I had a glass of wine and my cousin Angie was like, ‘Are you alright?’ because I was talking to myself and I was terrified. I was so scared. I had already gone through all the horrible ways it could go in my mind… I saw it live on iTunes and I waited for the first comment. Then I woke up the next morning and… [breaks into dance].” Beyonce has nothing to worry about! Her album will be spending it’s second week at #1 on the Billboard Top 200 this upcoming week!